After the success of Backbone , the team is back with the most sensational song of 2017 - Naah. The song has been Written and Composed by Jaani Arranged by B Praak. This uber cool dance video has been shot by Arvindr Khaira and features the Moroccan beauty Nora Fatehi who has slayed the video with her breath-taking grooves.Enjoy the song with over 11 languages and groove to the beats. 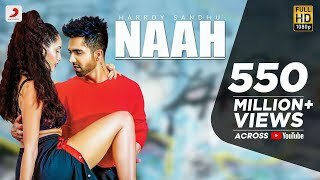 Naah HarrdySandhu Listen To Naah on your favourite Music Apps. Wynk Music - Saavn - iTunes - Gaana - Hungama - Jio Music - Idea Music - Book My Show Jukebox - Google Music - Apple Music - Song Naah Artist Harrdy Sandhu Starring Harrdy Sandhu, Nora Fatehi Lyrics Composition Jaani Music B Praak Recording Studio Studio Fuzz , Delhi Mixing Mastering Eric Pillai Future Sound Of Bombay Video Director Arvindr Khaira DOP Bhanu Pratap Editor Adele Pereira Colorist Nadeem Akhtar Assistant Director Harman Buttar Choreographer Sahaj Singh , Shreoshi Kumar Hair Styling Harrdy Sandhu Ali Khan Hair Styling Make Up Nora Juan Marcelo Pedrozo Costume Styling Nora Sunakshi Kansal Publicity Creatives Designs Roop Kamal Singh Aman Kalsi Digital Promotions Lovish Kathuria Label Sony Music India To set Naah as your caller tune. Airtel rs Dial 5432116427337 Vodafone rs Dial 5379965632 Idea rs Dial 567899965632 Aircel rs Dial 530006925684 BSNL SouthEast rs sms BT 9965632 to 56700 BSNL NorthWest rs sms BT 6925684 to 56700 For exclusive updates on Punjabi latest songs connect - - Twitter - Instagram - ... Audio on Sony Music Entertainment India Pvt. Ltd C 2017 Sony Music Entertainment India Pvt. Ltd.